But this final week of April should end on a very warm note for the Garden State. While Saturday continued our stretch of unsettled, wet weather, New Jersey enjoyed a welcome (and surprising) break from the rain on Sunday. The clouds, raindrops, and cooler temperatures return for another couple of days, before some big improvements as we enter the final days of April. As the aforementioned storm system comes closer and closer, steadier rain will push into the Garden State after 1 or 2 p.m. (at the earliest). Because of the clouds and rain, temperatures will be on the cool side. Forecast highs are in the mid to upper 50s for most of the state. I wouldn't be surprised to see a few lower 60s in North Jersey. We'll see the "brunt" of this coastal storm system starting around mid-morning Tuesday. It's going to be a wet day overall, with periods of steady to heavy rain. High temperatures again will end up in the mid to upper 50s. Finally some significant improvement! As this storm system moves away early Wednesday morning, showers will taper off. There's some disagreement among the models regarding the end time of rainfall — the GFS model pushes out all rain by sunrise Wednesday, while the NAM holds off the drier weather until late morning Wednesday. In either case, Wednesday afternoon will be drier and warmup, although still mostly cloudy. High temperatures will bump into the upper 60s (north and coast) to lower 70s (inland central and south). Thursday and Beyond: Warming Up! As long as the rain exits on time Wednesday, Thursday's weather will be simply beautiful. Partly sunny skies, with most high temperatures in the lower to mid 70s. It will be a bit cooler along the coast, but not overly so. The warming trend continues into Friday, with lower 80s likely across much of inland NJ. It will be a partly sunny day with a brisk southwesterly breeze, up to 20 mph. We will have to watch the skies Friday afternoon and evening, with a round of showers and thunderstorms possible as a cold front approaches. Given the heat (and energy) in the atmosphere, those storms could be on the strong side. That front won't have much of an effect on temperatures for Saturday, with highs in the upper 70s to around 80 degrees. Another very nice (probably dry) Spring day. I'm thinking Sunday will be the warmest day of the week, with lower to mid 80s statewide. 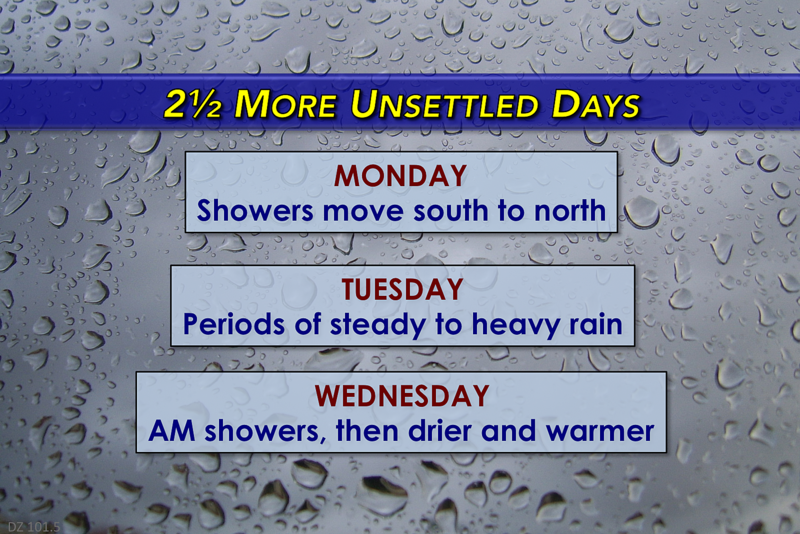 It will be a fairly unsettled end to the weekend, however. Models currently suggest showers Sunday morning, with a round of thunderstorms late-day. That timing, of course, is subject to change as the week rolls along.